Since Shiloh was born I have gotten SO many questions from you guys to do a review on the products I’ve shared. I shared this on stories already but want to share on here as well. I’m hesitant to review these products for you guys because I have quickly discovered every baby is so different. 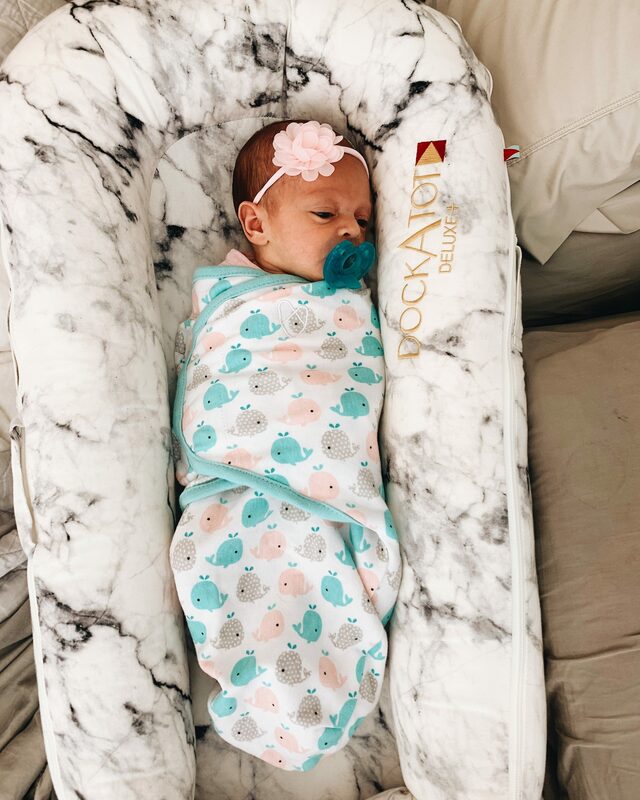 So many moms told me “my baby LOVES these swaddles.” I ordered them for Shiloh and she hates them haha. So, you really have to just figure out what YOUR baby likes honestly! Having said that though, I’d like to still share some of our most used baby products so far with you guys. These products have been super helpful for us so I thought I’d share my review to help make your baby shopping a little bit easier! 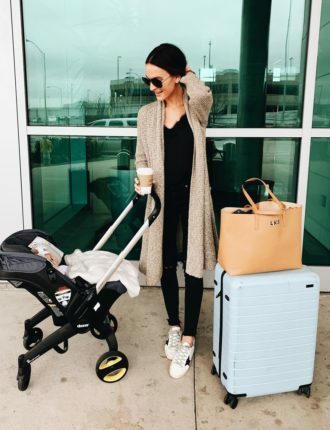 These are some high ticket items my friends, but I can honestly say we have LOVED this stroller and carseat. I’ve gone for tons of walks with Shiloh in the bassinet and she just falls asleep everytime. It’s so cozy for her and the quality of this stroller is amazing. 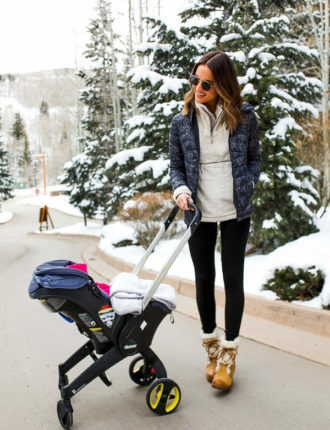 I also love that this stroller works with the bassinet, the carseat and eventually a toddler! This stroller is convertible and allows for multiple configurations. We also love the Uppababy carseat. It was really easy to install / figure out, and I think it’s really comfortable for Shiloh. She always falls asleep when we put her in it haha. The design of this carseat combines safety and simplicity and was awarded an NHTSA 5-star rating. Again, another high ticket item that has 100% been worth the money in my opinion. 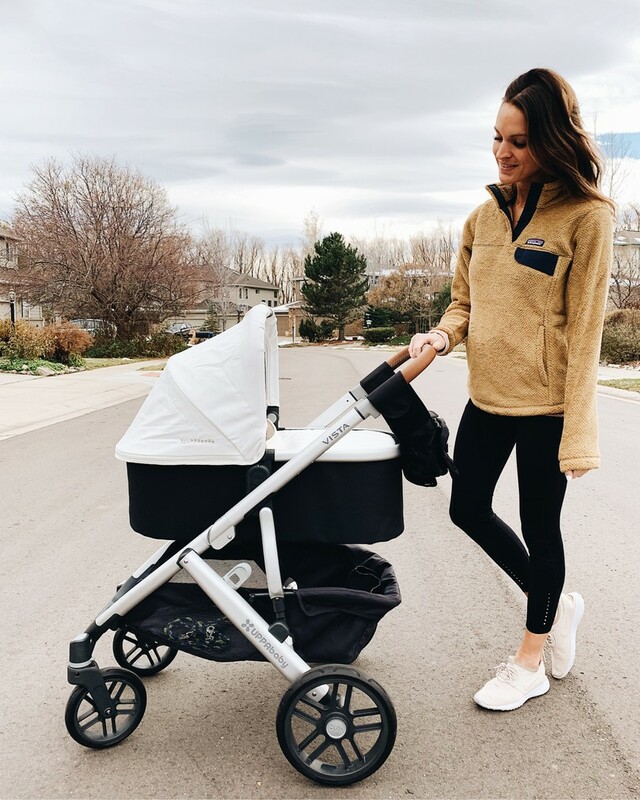 I won’t go into all the details about what this bassinet does because you can read more about it on their website, but essentially this smart bassinet detects crying and responds with soothing womb sounds and motion to calm fussing quickly. So when Shiloh starts to fuss a little bit at night, it will automatically increase it’s movement (slightly) and white noise. 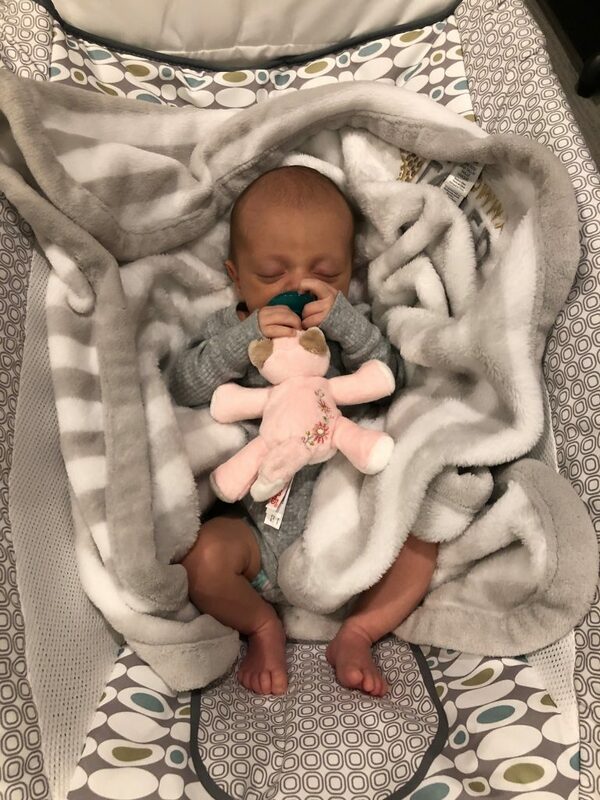 There have been TONS of times that Shiloh has calmed down without me ever having to pick her up out of the bassinet, because the swaying and shushing of the bassinet has soothed her! It’s honestly amazing and I love the swaddle / sleep sac it comes with. It’s super easy to swaddle her and she stays that way all night, as opposed to a giant blanket that they can easily break out of haha. So we have a lot of ‘bouncy seats’ for Shiloh. Our house (including the basement) is 4 stories so we like to have one or two on every level of the house. Out of all of our bouncy seats, she definitely prefers some over others, and I think the rock ‘n play might be her favorite! 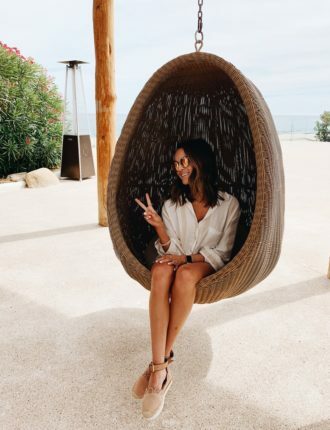 She’s super comfortable in it and we love how easy it is to transport from room to room. It’s lightweight, easy to travel with, and such a reasonable price. Before we had Shiloh I thought these things were strangely overpriced and overrated. I didn’t get the hype. That all changed though about 3 days after Shiloh was born haha we LOVE THE DOCKATOT. It’s basically a bed for your baby that you can carry to any room in your house and put on any surface. A lot of times when we’re eating dinner we put her on the dining room table in the dockatot while she sleeps haha. She naps so well in this thing, and sometimes we’ve even let her sleep in it at night. It’s lightweight and snuggles the baby in really well which is why I think they like it. 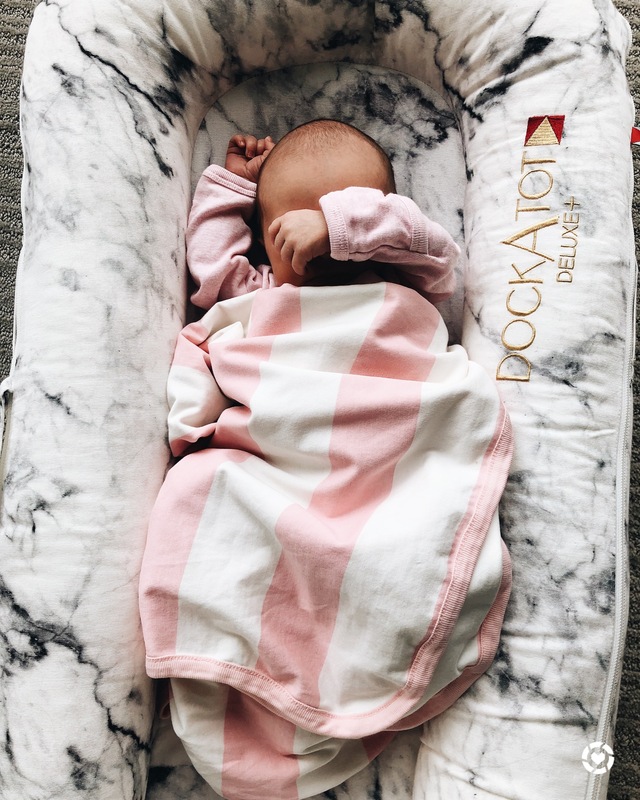 We also use this when we’re watching a show downstairs or something – we’ll just put her in the dockatot on the couch next to us! I think Shiloh’s favorite seat is a tie between the mamaRoo and the rock ‘n play. The mamaRoo is definitely a bit ‘fancier’ and has more capabilities. It’s designed to bounce and sway just like you do when you’re soothing your baby. We love the movement of this seat and the quality is amazing. It also has 5 different rocking and swaying motions to help soothe your baby. This one isn’t as easy to move though, so this typically just stays in our bedroom (whereas the rock ‘n play is really transportable). This is a sock that your baby wears that can track your infant’s heart rate and oxygen levels and is designed to notify you if something appears to be wrong. Before we had Shiloh I didn’t really think I’d want this. But, our very first night with her in the hospital Michael and I were both SO paranoid anytime we either couldn’t hear her breathing, or she spit up or sounded like she was coughing. The owlet has given us such peace of mind at night. We don’t get up to check her breathing anytime we can’t hear her, because we know if something was wrong, the owlet would notify us. I realize this is probably “first time parent probz” and we’re just paranoid because she’s our first baby ha. But regardless, this has definitely given us more peace of mind and worked really well for us. It’s a tiny little sock and Shiloh doesn’t even notice she’s wearing it at all! It fits very comfortably on her foot. I’ve shared this wrap several times on IG stories so y’all probably already know how much I love it! I had to watch a few videos to figure out how to wrap this fabric around me and make it work. But once I figured it out, I LOVED it. Shiloh does too! This wrap is so nice for times when Shiloh just wants to be held (or let’s be honest, when I just want to hold her), but I also need to get stuff done. She is so snuggly and warm in there and falls asleep everytime! I seriously love this carrier. This is a super simple bath tub we got just because it had great reviews on Amazon haha. A lot of you DM’d me in response to my bathtime videos with Shiloh asking about it, so I figured I’d include it in my list. It’s nothing fancy but works well and she’ll be able to use it for a really long time! 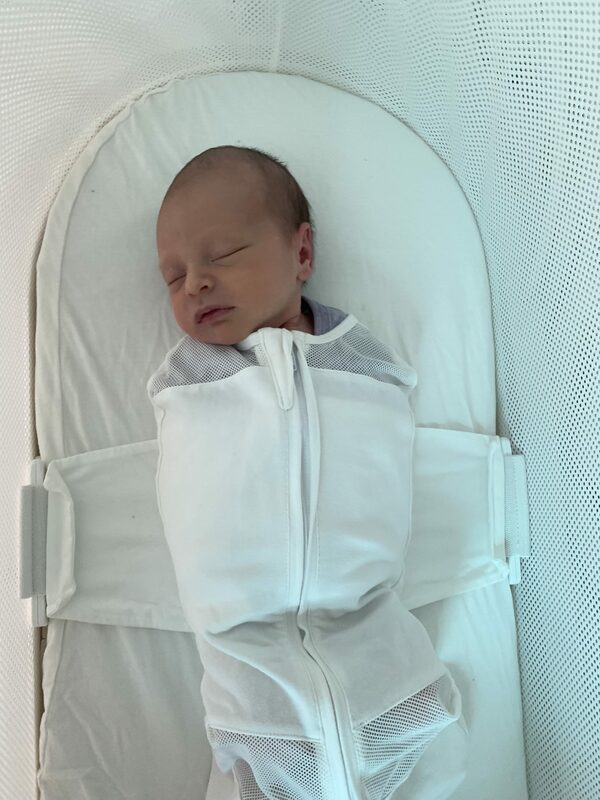 So at night we don’t worry about swaddling Shiloh because the Snoo has a built in swaddle / sleep sack thing which is so nice. But, if we swaddle her during the day for a nap, we use these swaddleme swaddles! I like them because they’re velcro so they’re super easy to use / figure out, and Shiloh’s arms actually stay down in them. We’ve tried a few other ones that Shiloh really didn’t like (just cried the whole time she was in it) and she seems to do good with these! But this is definitely one of those ‘every baby is different’ areas, so you gotta figure out what works for you! So Shiloh is only 3 1/2 weeks old so we are obviously still figuring out what works for us and I’m sure this will continue to change as she gets older! But hopefully this gives y’all an idea of some of our favorites and some of the products I would definitely recommend. Let me know if you have questions about any other baby items you’d like for me to review! Very helpful! I just got my snoo smart sleeper in and I’m 🤞🏼 baby boy likes it and helps him (and us) sleep! Especially with that price tag! But it seems to have amazing reviews so I’m excited to use it! Thanks for the reviews for Shiloh so far.. you are doing an amazing job! aw thanks so much kaitlyn! so glad it was helpful for you! 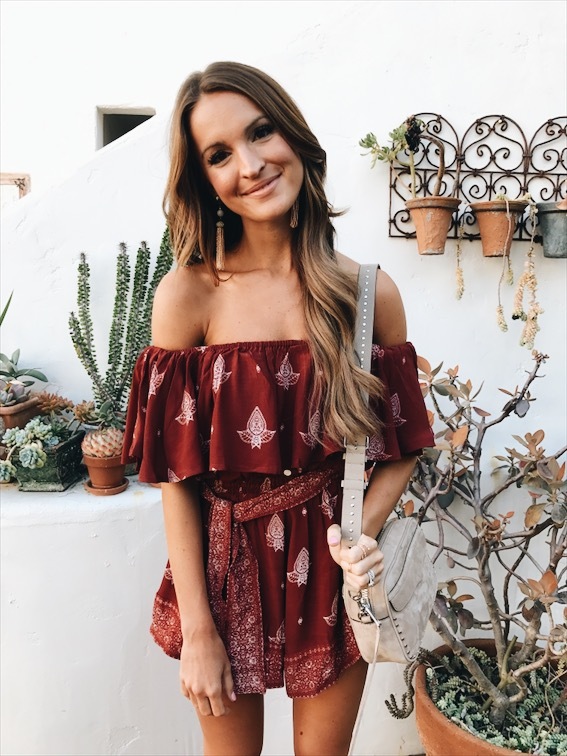 I saw on one of your stories that you got the Willow breast pump. What do you think of it so far? I’m debating if it’s worth the money:) thanks so much for sharing all your tips! I’m loving all the info because I’m due in March with my first baby. hi rachel! I absolutely love it. it is slightly slower (not by much) than my other pump, but it’s also really convenient! Thanks for all the great info! What do you think of the Willow pump? I’m trying to decide between the Willow and the Medela Freestyle. I’d love to know what you think! I like the willow a lot! it is slightly slower than my other pump, but it’s nice for on-the-go and multitasking. there are pro’s and con’s for both!